There is no mistaking the fact that two-seater sports cars are personal choice vehicles espousing driving fun, frequently with top-down exuberance, with few concerns for function or practicality. Despite the best offerings ever, sports car sales have plummeted — bringing into question the future of the whole segment. Buyers still have multiple options, however. Nissan, a competitor in this class since 1970’s 240Z introduction, solders on this year with the sixth generation of this classic two-seat coupe/roadster series — the 370Z. In many ways, the 370Z is an outlier among two-seater sports cars. Coupe pricing starts at an aggressive $29,990 with the 332-hp 3.7-liter V-6 and a six-speed manual transmission. This is $4,600 more than Mazda’s Miata or $4,300 more than the Subaru BRZ/Toyota 86 twins — each of which is a smaller, slower, less powerful two-seater. Jump to the Z Roadster and the equipment level rises along with the starting price; $41,820. You have other options here. Porsche’s Boxster starts at $56,000, Chevy’s Corvette convertible at $60,590 or Jaguar’s F-Pace at $59,990, all of which require significantly more financial commitment for fractional gains in performance — maybe more features. Rejoining the marketplace in the spring will be an all-new BMW Z4, in soft-top roadster configuration only. A joint project with Toyota, which will debut a Supra coupe later in 2019, these “twins” illustrate that the automakers believe that halo-effect sports cars are necessary for brand popularity — even if sales forecasts are far less than only a decade ago. Z fans can only hope that Nissan recognizes the value of this car, with its previous generation legacy models selling for more than their original retail now, and creates a modern Z. The current Z is now 11 years old; long in the tooth for regular cars, about average for many sports car models. Sporting a double-wishbone aluminum front suspension, a multi-link independent rear suspension plus a shock-tower strut brace over the engine, this short wheelbase chassis is responsive and nimble. Steering feel is quick, making the car extremely fun to drive, while big Brembo brake calipers create urgent stopping power. However, the chassis could use some more suspension compliance to better display the grip and ride balance that some rivals deliver. Top-down motoring is the essence of the Z Roadster’s portfolio. Air flow is aided by the small wind-blocker located between the rear headrests, ensuring that unwanted turbulence stays out of the car. Add heated and power-cooled seating and the Z proved quite comfortable even as the Maine summer mercury reached uncommonly humid temperatures. Three-pedal versions offer automatic Synchro Rev-match when downshifting — Nissan was first to offer in the 2009 Z. 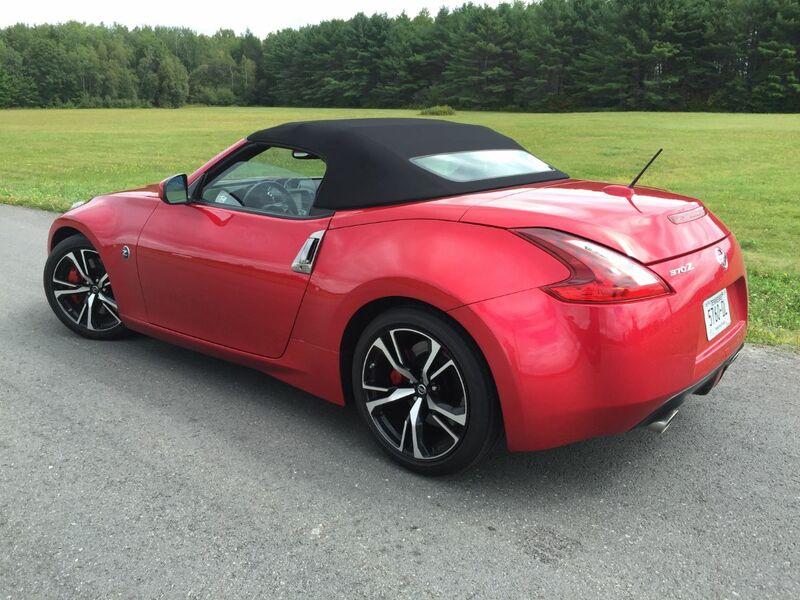 Our handsome Passion Red Sport Touring 370Z featured ($50,980 as shown) the optional ($1,400) seven-speed automatic which actually helps the Nissan accelerate quicker than the stick-shift models — and much faster than the lighter Miata or BRZ. Buyers have gravitated to automatic transmissions across the spectrum; fewer than 6 percent of new cars sold in America last year came with a manual transmission. Shorter and lighter than the previous 350Z due to the extensive use of aluminum and 4 fewer inches of length, the 370Z has received several interior advances to please buyers. Bose audio, 7-inch navigation screen, large rear-view monitor, keyless access and ignition, plus dual-zone climate are all welcome. Telescoping steering column, several recent electronic driving aids plus Apple/Android compatibility are all missing. Also missing is the mechanical symphony that has become common with many of today’s sports cars — especially the American pony cars. The Z’s urgent acceleration is rewarding to experience; some buyers will lament the absence of the performance soundtrack deemed essential to the passionate motoring experience often equated with top-down motoring. The 370Z remains attractive. The proportions work, the LED lights add distinction and the three-quarter view from the rear clearly illustrates the exaggerated haunches practiced by Porsche. There is also the general perception that this car is 90 percent of a Porsche Boxster for 75 percent of the money. Will Nissan build a seventh-generation Z? There is a sweet twin-turbo 400-hp 3.0-liter V-6 under the hood of the new Infiniti Q60 Coupe, the descendent of the venerable Q35, which was based on the 350Z coupe. So there is a capable powertrain already engineered. Nissan just has to create a comely body what should become the 50th anniversary of the Z sports car in 2020. Let’s hope it happens.